You know by now how a river gets all its energy, sense of direction, wonder, and belonging: it falls. It falls in the direction it finds most attractive — pulled by the ineffable. But even rivers can get b low back! This picture currently (ha) blows me away (haha). It’s crazy! Crazy beautiful, crazy funny, and crazy relatable! My takeaway: don’t worry! All the water and all our attention is still in the water cycle and finds its way. I like to think this river is having the ride of its life. Let ‘er buck! This entry was posted in Uncategorized on September 8, 2018 by Betsy. There’s your business, other peoples’ business, God’s business, and THEN there’s the fourth business — the floodplain. And that’s the lushest business of all. A pull by some unseen attractive force: you fall in that direction. You flow. And that’s where all your power comes from. That stuff you come across as you flow: the sediment, soil, and rock of the world through which you flow: you carry, shape, and set them down in various turns. This is your life’s work. This is how you form your edges and your base — the dimensions of your life that make you you and allow you to flow like a river and not just a sheet of water creeping across the land. The uplands: you’ve no role there. Its inhabitants may visit you for refreshment; its burdens may wash into your channel; but you’ve no control out there. Here is where you and the others and God all meet and co-create. The result — no matter whether its the narrow shelf of a self-sufficient F-type river or the wide expanse of the delta’s Da- or the sinuous, focused E-type river — is a lush, even, open space. A river’s best friends — deep-rooted, woody vegetation AKA trees — can grow there. Animals and insects thrive there and indeed require its presence. The floodplain is built by — and allows — your flooding. It makes your natural, expected overflows safe and, indeed, vital. The floodplain allows — and is built by — your meandering. This makes for a lot more fun and chaos in the world (and increasing that entropy is not only interesting but required by the Second Law of Thermodynamics!). It all feeds into each other: Your flow allows you to do your life’s work with integrity and then those resulting boundaries allow you to overflow safely into the outside world where, together with that world, you build the richest ecosystem of all, the riparian zone, which gives you and others the ability to adjust to whatever nature throws your way and to do it with beauty. Like a river, we most naturally and healthily relate to others in a space thats not exactly us and not exactly other. We meet one another in a place between us and make something there together. It’s fun and messy, and that’s probably the point. A practical river practice: Ask someone to make something with you. It will be shared creation — not yours and not their but a separate being. It could be collaborating on a doodle, a song, a dance; planting a plant; cooking some food; writing a naughty limerick or an ecstatic poem; carving a bar of soap, raising a barn, sewing a quilt; arranging flowers. This is especially useful when you need to figure out boundaries. If there’s someone who seems to infiltrate you with their mood or opinions (especially opinions about you) or if there’s someone who you tend to inundate, try this. And please share with me what you make! * As always, wherever you see the word God please substitute Nature, Universe, Uterus, Mystery, Ineffable, Unspeakable (YHWH), Source, Goddess, Unknowable, or whatever word appeals to you. This entry was posted in Uncategorized on July 17, 2018 by Betsy. Beavers and dam engineers share a secret — they must, right? After all, natural dams don’t last long and neither do most personal dams. But dams designed by clever minds, ah, those can last for centuries IF (AND ONLY IF) the beavers/engineers build and maintain a generous spillway. Let’s exploit that condition, shall we? A river will erode any dam eventually because water keeps flowing into the reservoir behind the dam, pulled by the attractive power of gravity. Pressure increases against the dam and at some point it develops a leak or otherwise overwhelms the structure… no matter how strong the material or deep the foundation. Guaranteed. That’s why a good dam designer incorporates a spillway to bleed off high levels of water. By the way, the “lizard” or “social self” part of your own mind is a brilliant dam designer. It’s not evil — it just misguidedly decides the safest strategy for surviving and thriving is to divert your energy for some outside interest that doesn’t care for your naturally wild and scenic river-self. I assure you, that part of your mind isn’t right. To free your river from this or any dam, all you have to do is find a spillway and shut it down. The problem is this: a spillway kind of resembles natural flow. You may be fooled into thinking it’s a good thing because, well, it seems some of the river water is making its way downstream, right? No, a spillway is never helpful if you want to be rid of a dam. Remember, a spillway single-handedly allows the dam’s survival. Spillways are not natural occurrences or made of natural substances: they’re always artificially constructed by outside “civilized” forces. ~ Spillways are not built by the river itself. You didn’t “hand-make” this kind of flow in your life. It’s not unique to you, to the flow of your desire, to the particular conditions you find yourself in. These patterns are meant to disperse energy on the spillway so the water is less “hungry” when it hits the natural channel downstream of the dam. ~ Spillways are always very strong and stable. They don’t erode or change over time. THEY ARE NOT AFFECTED BY YOU. ~ Spillways are either very smooth and straight or have some regular pattern. They’re not randomly bumpy or curvy. ~ Spillway water is unnaturally cold and “clean” — and not in a good way. When river water moves, it has power and does work. And a river’s life’s work is moving sediment. The river carves off, picks up, carries, and sets down little bits of the world it encounters. But the water behind a dam can’t do its life’s work. The sediment settles out at the bottom, and the water that spills through the gates is sterile — devoid of the experiences that healthy rivers and humans carry and care about. Spillways are seen, accepted and maintained by culture — even when culture doesn’t exactly love them and/or even hates and avoids them. Spillways are usually not pretty. Spillways are steep and straight and fast — a rush. Your natural channel erodes just downstream of a spillway. There’s always this ugly crash. Photo from High Plains Fly Fisher — click on photo to visit the blog. Even though they aren’t scenic or healthy, these tailwaters are popular with fishermen because fish congregate there..
Because it’s moving fast and is clean, the spillway water has a lot of power — hydrologists say it’s “hungry.” It devours the first non-reinforced thing it finds: itself. It ravages the banks and bed just below the dam. That’s why you see so much artificial armoring of the river channel just below a dam. Spillways may be used to generate power for others. If you want to be sure not to confuse a spillway with a leak (which we love because THAT’s how you bust a dam for sure), go here for details. What do you plug the spillway with? Short answer: Anything that works. Typical answer: Close the gate. The thing is, that’s often not doable from inside the river itself. You usually have to have help. Hire a monkey wrencher, a therapist, a coach if you can. It is so worth it. Long and hopefully more helpful answer: Block the spillway with river sediment, i.e., new thoughts about the past. I know it’s nice to be forward thinking, but that’s not what sediment is. Sediment is actual pieces of where the river has already been. There are many places in river restoration where we focus on the future and new possibilities, but I find that closing up a spillway requires very specific attention and language that attends to the past. Once you’ve attempted to plug a spillway, immediately turn your attention back to your longing sensation. Even if you can’t stop sending your attention down a known spillway, don’t despair. In the real world of dams, most leaks and dam failures occur when spillways are still working — it just takes a little longer. So try this spillway-plugging, and then, no matter what, return to playing around with your own delightful little leaks. If nothing else, it just feels good, and that’s success in its own right. Keep tuned for a fun and simplified dam-busting worksheet — I’m developing it in collaboration with one of the coolest rivers around! Until then, good luck experimenting on your own. Busting dams is the hardest and most profound personal and river restoration work there is. Please get help when in doubt and be gentle with yourself — if you end up staying dammed for awhile more, it’s not a big deal. You are fine the way you are; this stuff is just the gravy. Let me know how it’s going or if I can be of any support to you. I’m delighted to be of service AND your comments will help me with the worksheet I’m developing. 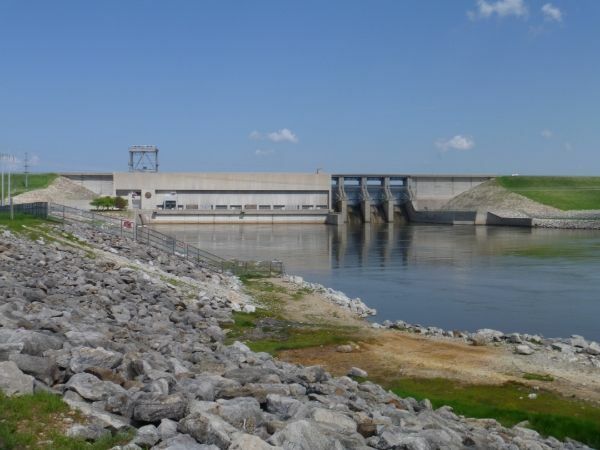 This entry was posted in Dams, power, spillways on January 5, 2018 by Betsy. Desire and its small personal joys are all you need to break whatever is damming your river. Dams are made of compacted earth, i.e., bits of the world that have been shaped a certain way and hardened with careful application of weight, cement additives, memory, socially-cultivated belief systems, or innocent errors in thinking. And whatever other benefits they may have, dams are not good for rivers. You can demolish ANY dam with dynamite, heavy machinery, pick-axes, or the blessed logic involved in simply inquiring into your own thinking. BUT. But sometimes the dam is just soooo big. Or it’s hard to get a real handle on exactly where the dam is or what it’s made of. AND/OR sometimes it’s logistically overwhelming to import enough blasting power or stamina to dismantle the thing. That’s understandable — river and human dams both are exceedingly well-built results of centuries of civilization’s best design efforts. Your river desires to move toward the sea, even/especially when your river is dammed. So here’s how you get rid of a dam: Just feel that longing. Let it exist and grow. Eventually, the longing burrows a little ways into the dam. It excavates more and more of the dam until it makes its way through to the other side. Then it’s an official full-blown leak. It begins to grow more rapidly until it finally and easily busts through the dam to continue the free-flowing life it desires. The river — and in this metaphor that means YOU — builds a leak from within its own channel as a natural result of its own natural power, attention, desire. It’s authentic. Possibly quirkily so. Leaks may be almost tortuously twisty. Leaks start very small and slow — tiny little activities that are less about movement and more about the intense, pleasurable, pressure of the longing. Later they increase, sometimes very gradually for quite awhile, until there’s a certain momentum. Leaks may be here and there, all over the place, not concentrated in one place with a defined focus. Leaks erode bits of dirt or concrete. They are a little messy at first, and increasingly so as they grow. People and cultural institutions that benefit from a dam do not approve of leaks. Leaks are usually private at first. Leaks are not useful to anyone outside the river (at least not until they have removed the dam and the river is back to its fantastic wild and scenic nature in which case the whole natural ecosystem rejoices as well as cool people!). Where in your life do you feel the pressure of a persistent and maybe somewhat undefined longing? Let it build. Memorize the sensation of that longing — of that which you desire. Drop into that feeling whenever you can. Where do you feel little trickles of energy pushing their way toward your deepest desire — even though they may not be making much headway? Keep doing that. This entry was posted in Dams, Uncategorized on January 5, 2018 by Betsy. You’d think that you’d be the first to know that your stream was dammed. Sometimes a peaceful water surface is hard to decipher: are you in the middle of a natural lake, a healthy lazy river, or a dammed up river? How can you tell? We can see dams in OTHERS’ lives pretty clearly. And they can see ours. It’s like they’re looking out an airplane window at Lake Powell’s Glen Canyon Dam on the Colorado River. But when YOU’RE the river or the canyon it runs through, or even if you’re a human floating in a canoe, you just can’t tell for sure. It can be frustrating not to know, especially if someone hints or you have a vague feeling. ~ If you realize you are indeed dammed, it can be difficult to find the dam. ~ Once you do, you have to figure out how to get rid of the dam. ~ Unfortunately, it quickly becomes almost impossible to picture life without the dam, and so it’s hard to remember why you should go to all that trouble to deal with the it. Heck, you think, reservoirs are plenty nice. Here’s the problem with a reservoir: it’s simply not a river. You can have a perfectly nice tame reservoir. The reservoir can store water for all sorts of “civilized” uses: certain water sports that need flat water, human and livestock drinking water, irrigation water for crops, and electrical power generating plants. If you care about a river in any way, then first and foremost you have to be sure it remains a river. Likewise, it’s best for you to be your actual real self and not be turned into something completely different in order to serve civilization’s needs to drink you up, recreate on you, or harness your energy for its own needs. There are other ways those humans can have fun, stay hydrated, and power their refrigerators. Ways that don’t involve eliminating your stream’s very identity. 1. Do I feel myself holding still for a long time — for longer than I ever have before? Dammed waters don’t flow much. Dammed people find themselves and, most notably, their attention stuck in one place. As Mihaly Czichzentmihalyi said (when he visited our town! ), our attention and how we direct it is the most valuable resource of our lives. He elaborated that our health and our time are vital — they are “our life.” But then he recommended we ask ourselves why they are so important. It’s because we use them to direct our attention as we want. How we direct our attention is how we “spend our lives.” That’s the truly important resource. 2. Do I feel myself “dropping my load” albeit probably invisibly, far below the surface? Without velocity, dammed waters have no carrying capacity and no choice but to drop their life’s work, i.e., the sediment (the bits and pieces of experience they have picked up along the way). This is why reservoirs eventually silt in. 3. Have the other life forms who thrive in and around my ecosystem changed? Do I notice lake fish instead of river fish? Seagulls instead of dippers? Are the minks gone? Are there only very few typical native riparian grasses, shrubs, or trees on my edges? 4. Do I find the motionless part of my life getting bigger and bigger? Dammed rivers are much deeper than they were before they hit the dam. They’re also hugely wide. This is partly because the valley is wider as you go up. But it’s also partly because flat water erodes the sidewalls of any river channel. (It’s the only work that water can do; the only way it can increase entropy; and even dammed water must obey the Second Law of Thermodynamics). Dammed rivers also cut their way upstream into their own natural channel bed, lengthening the flat-lake surface. This lengthening happens because the river water picks up speed where it drops into the deeper lake. That quick increase in power is directed against the only thing it can access — the river’s foundation. This “head-cut” works its way upstream… pretty much forever. In order to know if your current flow, work capacity, ecosystem, and dimensions are appropriate, you must be able to remember life upstream or envision life downstream . A dam is made out of solid, physical stuff. Matter. Usually it’s sediment — concrete or compacted dirt — though sometimes it includes discarded manmade objects like old cars, mattress springs, and radiators. As you remember, moving sediment is a river’s life’s work. That’s why dams are confusing. And ironical. Dams are built with the river’s own most basic ingredients: dirt and rocks. Dams, like the river itself, are made out of bit and pieces of the world that have been picked up, moved, and placed in a particular way — but in the case of a dam, the material’s artificially compacted, smoothed, and carefully shaped into a particular human design. Humans are similar. We naturally build a healthy life out of bits of experiences we’ve picked up, carried, set down in a new way: thoughts. When we are dammed, it’s by artificial versions we’ve created of our experiences: untrue beliefs. Don’t feel like a freak. Almost all rivers have been dammed somewhere at some time. Here’s a list of free rivers, but remember it all depends on how you define the river. Some/most/probably all of these rivers have tributaries that’ve been dammed. Likewise, all people have been dammed up at one point. Even supposedly enlightened people rarely say they’ve been free since birth. Tibetan Buddhists may think the Dalai Lama has been always free, but I’ve never heard him say that. Indeed, I’ve heard him talk about thoughts he has difficulty with (e.g., how to handle his anger toward the Chinese government). By far most of us still have some little dams here and there. It’s part of life. Step 1: Is there an outlet — a place where your water flows downstream? Start by finding your river’s edge or boundary. ~ A river boundary marks what is and is not river. ~ A river boundary is where water meets dry land. The shoreline is where the fluid medium that carries your river’s energy (i.e., water) meets sediment that was set in place by someone else or maybe by your river’s previous flows. Now your water doesn’t go there. A boundary is a line between where your time and energy go and don’t go. It’s characterized by a solid belief that you don’t actively attend to — usually because you accept it as truth. Sometimes you’ve investigated that area-of-no-attention clearly; sometimes you just happened never to have “gone there.” Either way, you currently don’t have to give that cluster of thoughts a second thought. Trace around your edges, locating your boundaries. Eventually you will find a place where water comes in. You’ll always find a place where your life’s energy — your attention — is replenished from upstream. Always. Maybe it’s sleep and night dreams. Or day dreams. Maybe it’s a topic where you like to entertain new ideas, person that refreshes you, or place you like to breathe. Maybe it’s just breathing itself. If you’re alive, you’re being fed. Keep looking around your edges and see if you find a place where even a trickle of water goes out. A place where you spend your time and energy — your attention — moving on toward some often unknown but attracting feeling. If you find an outlet: go here to find out if you’re looking at your natural channel or a dam’s spillway. Also go here to see if it’s a leak… let’s hope it IS. If you can find no outlet: you know for sure you’ve been dammed. Go to the next step to locate the dam. Step 2: Is there a place along your edge where you feel your attention drawn and held in one place repeatedly — as if your energy pushes against it in constant pressure? Most of the edges you find — the beliefs you hold to be true — don’t have a lot of energy or pull. As you identify them, you say “Oh yeah. There’s that.” But sometimes there’s a “fact of life” you just keep running into, turning over and over in your mind. If yes, that’s most likely a dam you’re pushing up against. You can block a river’s flow downstream, but the river still wants to go there. It’s pulled there. It can’t help but feel the attraction of the sea though it can’t see or describe what pulls it. The same is true of you. Even if you’re stopped up, you will feel an undefinable longing. What’s in the way? Look for that thought you keep bumping up against — that solid place accumulating flotsam and jetsam. To be sure, evaluate it using the next step. If you can’t find such a spot but you’re pretty certain there’s a dam somewhere, that’s okay. Walk your boundaries again and examine each spot using the next step. –> Is this boundary/shoreline/thought more uniform in texture and slope than your other boundaries? Is it exactly tailored? Most dam surfaces are only one material and they’re compacted and shaped into very specific, very even surfaces. Sometimes the slope will be more gradual than your other boundaries (if your natural river was in a canyon with steep walls). In other cases, the dams are obviously steeper than the sides of the original river valley. Either way, natural river banks are pretty variable. They may have layers of different sediment laid on top of one another, or they may be bumpy and wavy; but they rarely stay even for long. Even smooth rock canyon walls vary more than a dam’s face. False thoughts are the same way: they’re usually pervasive blanket rules (“everywhere”), absolute permanent conclusions (“always”), or exquisitely personal in application and implication (“because in my case…”). ~ Interesting Note: Testing a boundary’s strength doesn’t necessarily tell you if it’s a dam. Yes, engineers want dams to be strong, but sometimes, as in the rock canyon, a stream’s natural boundaries are equally strong. Sometimes, in the case of compacted earth dams or push-up dams (described below), the natural healthy boundaries (and, in a human, true thoughts) are even stronger than the dam. Junk dams, as we discussed above, are where people have tossed any old inert, unusable, machined object into the river. These dams are way more irregular than your regular boundary and recognizable by their inorganic, jagged, character. Be careful with them, as they not only block you but can cut you or trap you in their disorganized jumble of parts. Push-up dams are built by people who drive big front-end loaders into the river and bulldoze the river bottom up into a dam. Usually these dams wash out every year and have to be rebuilt. These dams are tricky to recognize because they are made of the exact same material as the river itself and are not particularly compacted or smooth. You have to use the other tests to differentiate it from a healthy boundary. They are mostly recognizable because the river’s width and depth at the site are unlike any natural river type: the river is abruptly and oddly deep across the entire width of the river, and the water surface drops sharply on the other side of the dam. –> Is this boundary/shoreline/thought mostly devoid of plants and animals, i.e., is there a marked lack of lively, growing beings with roots and social systems that thrive because of access to your water, your energy, your attention? Dams don’t encourage much life. No trees or shrubs. Very few grasses. Occasional mosses. Without those places to browse, hide, or build forts, the deer, raccoons, and playful humans don’t hang out there either. False beliefs you hold also aren’t full of growth, life, or nourishment. Friends and loved ones don’t usually hang out there. Stubborn folks do love a dam. If the only life forms you find inhabiting a particularly steep, hard thought of yours are goats, it’s probably most certainly a dam. –> Is there an abrupt drop-off on the other side of the boundary? And when you look down there, do you see a different, attractive version — even just a trace — of your very own energy and attention? 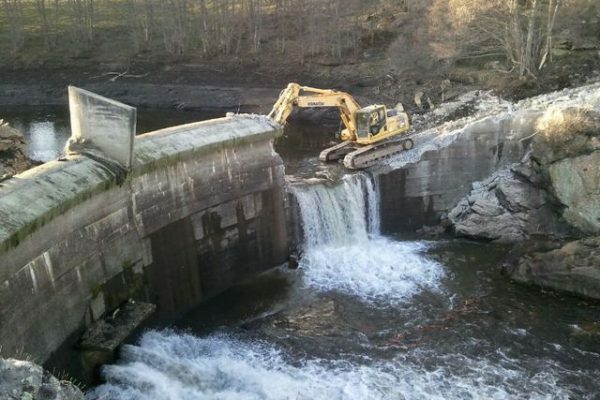 Now go ahead and get rid of that dam. There are three ways to do so. ~You can blow it apart from inside the river with longing. Click here and here to see what I mean. ~ Or you can just go around it and create something completely different. That link is coming soon. The best method? It depends on your circumstances. I’m currently partial to the second way as it’s available to everyone and is the easiest, but try them all out for yourself. Dam removal is the most important part of stream restoration in many ways, and I’m thrilled to be decoding its meanings for my own life. I sincerely hope you enjoy it and that it helps you with the stuck areas in your life. Please let me know how your experiments go! This entry was posted in boundaries, Dams, power, slowing down, thoughts, work on January 5, 2018 by Betsy. Which of the following is the healthiest stream — which would be your best Reference Reach? “It depends,” you insist? Ah, you are savvy fluvial geomorphologists. EACH of these bits of river is in fact a reference reach — for that particular river. Just like you, a river’s point of reference is within the river itself. Looking at the 7 different types of healthy streams above (click on each photo for more info about that type of stream or click here to take the river personality quiz! ), it’s obvious that if you applied E’s typical pattern to an A-type river, everything you decided to do would be a Very Hard Thing indeed. But when you pull your reference point back inside the river that runs through YOU instead of the one that runs through someone else (no matter how admirable that someone else may be), nothing is as hard as you originally may have thought. Once you’re operating within your own way of doing things, it’s clear WHAT the ideal things for you are (what is your most healthy width-to-depth ratio, slope, sinuosity, etc.) and it becomes easier to do the ideal things than NOT to. HOW: All you have to do is shift your attention inside. But sometimes, when you’re out of practice, it’s nice to have some clearer instruction. My teacher Martha Beck taught me and the other coaches in her programs to help humans find their point of reference is the same way hydrologists find a river’s Reference Reach: by tuning into the inside of the body. Yes, a river has a body and it’s the key to understanding what has happened to it and what wants to happen next — that’s why we call this field fluvial geomorphology: we study the earthen (geo-) body (-morph) laid down by running water (fluvial). We do this by wading up and down and back and forth in the river, surveying with a laser level, observing it, and, yes, picnicking on its banks and floating and splashing a bit. Turns out your grasp of the river increases the more time you spend enjoying it. Click here if you want to read a post describing one way you can find your own Reference Reach(es). But really all you have to do is go inside. Observe what’s happening in there, enjoy it, and you’ll know what to do next. This entry was posted in Uncategorized on September 30, 2016 by Betsy.